6 May - 17 September. 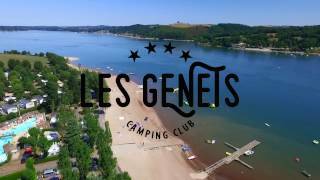 This family run site is on the shores of Lac de Pareloup and offers both family holiday and watersports facilities. The 163 pitches include 80 grassy, mostly individual pitches for touring units. These are in two areas, one on each side of the entrance lane, and are divided by hedges, shrubs and trees. All have 6A electricity, water and waste water drainage. The site slopes gently down to the beach and lake with facilities for all watersports including water-skiing. There is also a full entertainment and activities programme available in high season. The hilly landscape of the Lévézou plateau gently slopes between Millau and Rodez. In this vast area, green prairies and big lakes colour the landscape - it's a beautiful, unique natural environment. Two sanitary blocks are equipped with showers, one with suite for disabled guests. Nursery. Washing machines and dryers. Well stocked shop. Bar. Restaurant and takeaway. 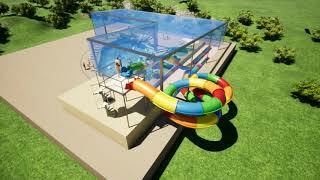 Refurbished heated outdoor pools. Sandy lake beach and lake with facilities for all watersports including water-skiing. Kinder play area. Mini-golf. Mini sport area. 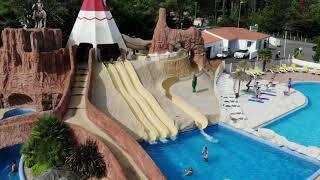 A full entertainment and activities programme is organised in high season and there is much to see and do in this very attractive corner of Aveyron. Bicycle hire. Boat, pedalo, canoe, kayak and paddles hire. Fishing on lake. TV in the bar. Free WiFi on all site. The site is near the village Salles Curan. From roundabout of Salles-Curan take D577 for 4 km. and turn right into a narrow lane immediately after a sharp right hand bend. Site is signed at junction.